Colleges and Universities. Applicants having Master Degree or equivalent degree qualification with 55% marks (SC/ ST/ PWD- 50%) are eligible to apply for this North East SET- 2018 exam. There is no age limit. Please see the below given information regarding North East State Level Eligibility Test NESLET- 2018 Eligibility Criteria, Location, Recruitment rules, Age, Test centres etc. 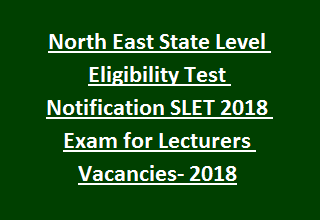 Interested Applicants for North East State Level Eligibility Test NESLET Exam may apply online using the official website www.sletneonline.in. Application link opens from16th October-2017 and closed on 30th November-2017. Date of the examination will be updated soon on the website. Examination Centres and other application procedure details are mentioned in the notification. North East Set- 2018 for the candidates of North Eastern Region (Assam, Arunachal Pradesh, Mizoram, Manipur, Meghalaya, Tripura and Sikkim). Go through the Notification for North East SET- 2018 related information. There is no age limit to attend North East SET Exam- 2018. Candidate must have qualified Master Degree or equivalent degree with 55% marks (For reserved candidates/ PWD- 50%) are eligible for attending SET test. NESLET Exam consists of 3 papers and consists of Objective type questions. Minimum aggregate marks to qualify in this North East SET exam is 40% for general category and 35% for reserved category. i. NESLET Application form fee is Rs. 400/-. Applicants seeking the admissions for NESLET Exam may apply online using the official website www.sletneonline.in. Read the guidelines to fill the application form. Upload the attested copies of M.A/ MSc/ MCom certificates/ Mark Sheet, Signature, Colour Photograph, Category certificates along with the application form. Last date for application submission is 30-11-2017.